You’ve adventured across the realm of Terrinoth for years, in games ranging from the dungeon-crawls of Descent: Journeys in the Dark to the epic fantasy warfare of Runewars Miniatures Game. Soon, you’ll have the chance to get to know this world more intimately than ever before through the narrative adventures of Legacy of Dragonholt, releasing at your local retailer and online through our website on November 23rd! As a narrative adventure game, Legacy of Dragonholt occupies a unique space in gaming. The adventures that you embark upon are not about winning or losing. 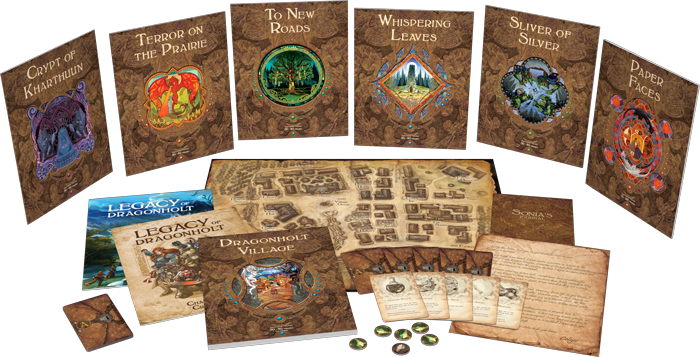 Instead, they’re about the stories that you can create—on your own or together with your friends—as you journey to Dragonholt village and beyond. 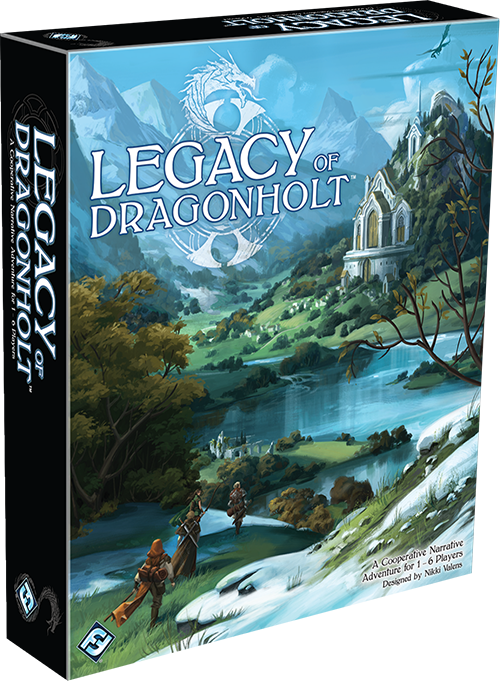 Drawing elements from adventure board games, roleplaying games, open world video games, and even Choose Your Own Adventure books, Legacy of Dragonholt is a gaming experience and an invitation to adventure like none other. Whether this is your first time entering Terrinoth, or you’ve gone on countless adventures over the years, you would hate to be caught off-guard and ill-prepared for the quests that you’re about to begin. Today, we’ve uploaded not just the rules, but a whole host of supplemental material for Legacy of Dragonholt. You can download it all from the Support section here, or read on to download these materials and learn more! The first thing you’ll need is the rules for playing the game, of course! If you’re ready to go from the moment you pick up the game, Legacy of Dragonholt can cast you directly into the adventure and teach you to play as you go through the first adventure, To New Roads. Still, if you have questions along the way, or you’d like an introduction to the game, the Rulebook (pdf, 7.3 MB) offers an excellent resource for you to take along on your adventures. You wouldn’t be able to make it far without creating your character though. The avatar that embodies you in the game could be a catfolk bard, a dwarven apothecary, or an elf brawler, but no matter who you choose to become, it all begins with the Character Creation booklet (pdf, 3.5 MB). Offering plenty of information about creating a character, and packed with additional lore about the races, classes, and cultures of Terrinoth, the Character Creation booklet is your first step on your way—before you even open the pages of To New Roads. Of course, Legacy of Dragonholt offers countless storylines, as well as creating a world that lives and breathes and changes based on your interactions with it. Every adventure, as well as the main village book, has multiple storylines for you to explore, and even the most dedicated adventurers won’t be able to find everything on a single playthrough. 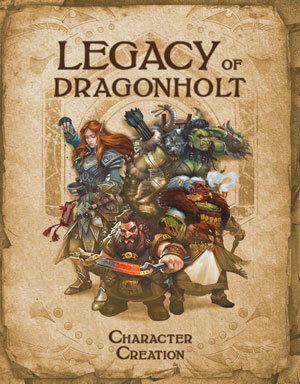 So that you can adventure into Legacy of Dragonholt again and again, we’ve provided an easily printable Character Sheet (pdf, 26 KB) and Tracking Sheets (pdf, 89 KB), so you can play through these adventures as many times as you like. Finally, we’re proud to offer two pieces of supplemental materials to Legacy of Dragonholt. While neither of these supplements are required to play the game, they each have something to offer to your journeys. If you’re eager to get into the game as fast as possible, or if you’d rather not create your own character, we have an assortment of Pre-Made Characters (pdf, 7.3 MB) that you can use instead. Each of these characters comes already complete with skills, background, physical description, personality, and ideals—you only need to bring them to life! And while you’re on your adventures, it’s always good to have something to strive for. Our Achievement List (pdf, 2.1 MB) gives you some goals to complete, as well as just a taste of the kinds of adventure you can expect to find within the game! Tomorrow, you’ll be able to get your first look at the countless adventures that await within Legacy of Dragonholt—and we want you to be well prepared. Download the rules and other materials above, and pick up your copy of Legacy of Dragonholt (ORA01) at your local retailer or online through our website tomorrow!